znewnew has no other items for sale. A++++++ quick to ship. I’ll buy again from this company for sure. I was skeptic at first because of the price but this thing works like a charm. I live in a rural area..about 25 minutes away from anything and everything. placement and position is key here. I attached this to a 10ft flag pole and mounted on the side at the top of my house. Search online and find out where your carrier's closest cell towers are and position this in that direction. Only reason for 4 stars was because of the instructions and pictures. they dont match but it wasnt too hard to figure out. overall, I'd definitely buy again. Working just as good the $400 unit I had before that crapped out after 2 years. At this price I am buying another one for my garage, could not justify that at $400. Wish I would have bought one of these back then. 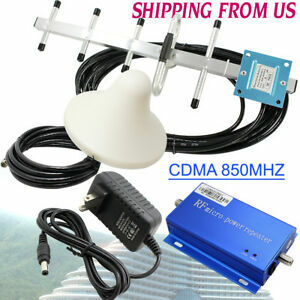 These CDMA amplifiers work great. Be sure to point your directional antenna to the nearest tower for your carrier. If you're having issues with calls after setup. Just do an online search for Cell phone towers in my area. There are websites to show you where every tower is & what carrier they are. See where the tower is. Then pull up google earth. Find the tower again on there. Use the distance measuring line function on Google Earth to draw a line from the base of the tower. All the way back to where you'll be installing your antenna. And you'll easily see the exact direction you need to point it according to your location. If you're having issues try raising the antenna above your roof on a pole. Or try pointing to a different tower. And be sure to not be near any power lines while installing. They can kill you & have unwanted interference with your device. But these are a good buy. Very handy for remote areas. Make sure you can at least get a faint signal on your phone outside in the area you're going to install your antenna before buying one. And you'll be fine. even better than they say, signal even emits to my cel phone on the outside of my home. Five bars inside, four outside the door and three four foot further in an area that had nearly none! Can't beat the price, My neighbor came over to see it and commented that he was definetly going to get one! I am very pleased with this cell amplifier system. Before the system, we only received 1 bar of service with frequent call dropping. Now, we are at 5 bars with excellent call quality. It is critically important to aim the external antenna accurately as it is very directional. When I was not aimed at the tower, we had no improvement on the signal, so it takes some patience to set it up correctly. It is well worth the effort, however as once aimed correctly, you will be rewarded with excellent signal strength. GREAT PRODUCT!